Say you’ve devoted enormous time, effort, and thought into creating an institution or initiative of dear importance to you, one that advances your vision and values while offering a unique contribution to the world. Then, either during the launch stage, or one year or five years or twenty years down the line, someone comes around — let’s call him the Takeover Artist — who sees your entity as the ripe host for a major project designed and led by (drumroll, please) the Takeover Artist himself. The Takeover Artist may talk in grand and self-aggrandizing terms, presenting himself and his ideas as just the tonic your group needs to become Something Very Special. There is an energy, a swirl of ideas, and a quality of insistence about this person. He may detect an insecurity and play on it, suggesting that you must take advantage of his expertise and ideas to move to the next level. However, there’s a voice in your head saying hold on, I’m not getting a good vibe about this. Maybe it’s his lack of precise thinking, the lack of genuine congruence with your core priorities and values, or his boastful claims of access and experience. Taken as a whole, something just doesn’t feel right to you. Of course, not everyone who approaches you with Big Ideas is a Takeover Artist. Someone may have good intentions, but maybe her proposal is lacking on the merits or isn’t the right fit. Perhaps she holds unrealistic expectations of what it takes to grow and sustain a quality new initiative. Possibly she’s enamored of what you’ve done, and wants to jump into the deep end right away. By contrast, the Takeover Artist regards your creation as having many of the pieces he needs to further his pet idea, and he’s willing to “partner” with you in order to harness your resources and networks, all of which may have been painstakingly built up over the years. There’s a dose of manipulation, exploitation, and even outright theft underneath this approach. How do you distinguish between the well meaning but overly enthusiastic newbie vs. the Takeover Artist? One tactic is to offer the new person a lesser but genuine role in your efforts, without committing to her idea. If she says yes and gets involved in a positive, constructive way, then everyone benefits! Later on, possibly she revises and tweaks the idea she originally proposed to you, and it turns out to be a good one! But if she disappears quickly from sight, then her intentions have become quite transparent in a negative way. Takeover Artists usually don’t hang around for long when they can’t get their way from the outset. Thwarted in their original plans or desire to change everything to their liking, they take flight, looking for someone else to “partner” with in a one-sided way. Ultimately, listen to your instincts and know thyself on this one. If you’re eager to please, you may be tempted to commit to a bad idea even if that inside voice is screaming “no.” If you’re more set in your ways, you may be too quick to dismiss a good person or promising project. At first, the wide-eyed rookie and the Takeover Artist may seem much alike, but a quick scratch beneath the surface should reveal the differences between them. The former may turn out to be a diamond in the rough, while the latter can drain time, energy, money, and spirit if you let things go too far. This post is inspired by a delightful conversation I had on Monday with some friends who are working on potential collaborations between their respective institutions, both of which they co-founded. We had a brief but humorous side chat about people who march in with grandiose ideas that, when given too much rope, turn into huge distractions. Is America “On the Beach” about its retirement funding crisis? Is America simply waiting for the huge, coming crisis in retirement funding to overtake us? What happens then? 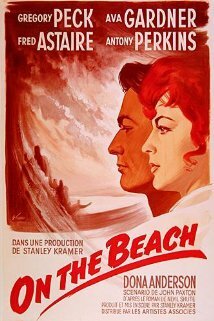 The situation reminds me of the 1959 movie, On the Beach, starring Gregory Peck and Ava Gardner. In the film, Australians are attempting to carry on with their everyday lives, while knowing that massive, deadly nuclear fallout, which already has wiped out most of the rest of humanity, is heading their way. When that occurs, they, too, will have no hope for survival. For those in a position to do so, this means paying close attention to retirement funding and engaging in steady, informed saving and investing. However, the realities behind the numbers are that many Americans will not be in a position to make up large shortfalls in expected retirement funding needs. In other words, America now understands that this is a crisis. It’s why I invoked On the Beach: We seem to know what’s coming, but we’re basically conducting business as usual. I guess it’s easier than imagining the specter of millions of people heading into their senior years with little or no retirement savings and a frayed safety net beneath them. Many around my age (50-somethings) are bravely saying, “I’ll just have to work forever,” but for a whole lot of reasons, that choice won’t be available to everyone. This is not a fun topic; it is a source of anxiety and stress for many, especially among my age cohort. However, unlike the Australian denizens in the movie, we are not necessarily doomed. We can undertake measures to soften this crisis — like shoring up the Social Security system, which is eminently do-able — especially if we can summon more collective concern, caring, and kindness than what now dominates our political dialogue. Instead of feeding on the usual nastiness that pervades typical cable news programs, let’s wrap our attention around these more significant concerns with some genuine heart quality and determination. The stakes are too high not to do so. When is phony behavior at work something we should shrug off as a minor annoyance, and when is it something we should be concerned about? At a time when harsher terms are often used to describe dishonest behaviors and people, the word “phony” seems rather trite, like something from another era. I’m not necessarily calling for its resurgence, but I’m wondering how it applies to today’s workplace. More often than I’d like, terms such as narcissistic, psychopathic, and sociopathic enter my conversations about workplace bullying and related forms of severe mistreatment at work. Sadly, if the shoe fits…. “Phony,” however, has a gentler sound and feel. It may be an appropriate term to describe behaviors that are insincere, though perhaps not driven by malicious intent. Like the HR director saying with a smile that the company’s health care plan is actually better for you, despite the higher deductibles and co-pays. Or the real estate agent trying to sell you on office space she knows doesn’t quite fit your needs. Such lighter level phony behaviors at work aren’t nearly as menacing as bullying, harassment, and mobbing. They usually don’t threaten our livelihoods or job security. Of course, underneath that quality of insincerity is an assumption that the person on the receiving end can be sold a bill of goods. If we think about it too much, we can let it push our buttons or get under our skin. Furthermore, lest we get too judgmental, let’s acknowledge that people acting in apparently phony ways may simply be trying to acclimate to a role or work on their own stuff. Or perhaps it’s part of a required script at work, like that imposed by a retailer on its customer service workers. Maybe the term applies to something we’ve done or said, voluntarily or otherwise. On the other hand, phony behavior can be a mask for something more pernicious. Like the boss who tearfully tells her staff that she’s doing everything she can to avoid layoffs, after already having informed HR of the people to be terminated. Or a co-worker who gives you a big smile as he shamelessly tries to flatter you into applying for a job that isn’t right for you, because he knows it would derail your career and he wants you out of the way. So, here’s where we must make distinctions. Most of us can and should deal with the occasional snake oil salesman or superficial dishonesty. Don’t sweat the small stuff, right?! By contrast, a workplace grounded in a culture of insincerity and dishonesty is an especially capable host of abusive behavior, and this is when our antennae should be up. In such instances, beware of workplace aggressors who dress up as mere phonies. Homework assignment: Google “phonies at work” and you’ll come up with a lot of interesting takes on this topic! When I saw this ribbon by artist and designer Will Bryant, I knew I had to write about meetings that should be e-mails, and e-mails that should be meetings. Quality leaders make the best use of meetings and e-mail communications. They understand that meetings should be devoted to more important matters, especially when discussion and active deliberation are merited. At times, this may include uncomfortable or tense dialogue, but good leadership is all about working through such exchanges. Weak leaders, however, are more likely to apply these rules of thumb: Avoid tough topics in meetings by stuffing the agenda with information, announcements, and presentations on comparatively minor subjects. Save the important and difficult topics for e-mails, especially if there’s anything smacking of bad news or controversy. Make it harder for people to ask questions, raise concerns, or offer comments. If you’re in a dysfunctional institution, especially in academe or the non-profit sector where larger group meetings are standard fare, then you may know exactly what I mean. 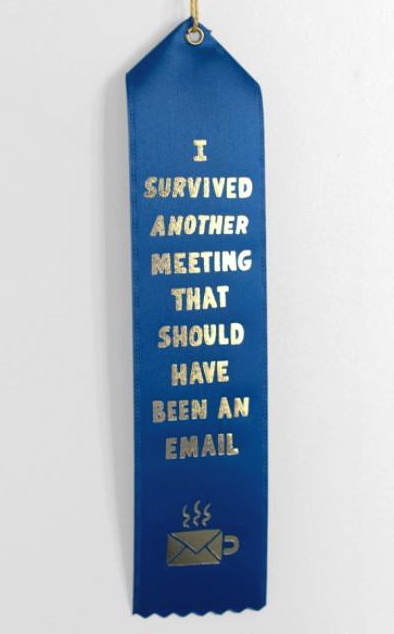 Bad use of meeting time is a practice truly deserving of a ribbon. You may order Will Bryant’s ribbon for yourself and loved ones here — only $3.50 plus s&h! Hat tip to Laura Puchtell Barclay for the heads up on the ribbon. University of Texas journalism professor Robert Jensen, in his thought provoking little book We Are All Apocalyptic Now: On the Responsibilities of Teaching, Preaching, Reporting, Writing, and Speaking Out (2013), urges intellectuals to be “responsibly apocalyptic.” I’ve discussed Dr. Jensen’s book before, and I’d like to spend a little more time with it. 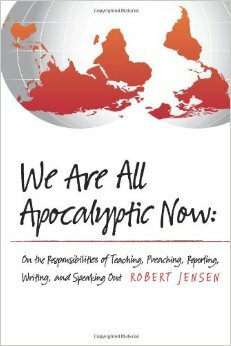 Jensen defines apocalypse not in dramatic Biblical terms, but rather in reference to “crises that concentrated wealth and power create.” He continues, saying that “(i)t is not crazy to look at the state of the world — economically, politically, culturally, and ecologically — and conclude that there are rocky times ahead.” However, rather than invoking “a reactionary theology” that predicts “the rapture to come,” the concept of “apocalyptic vision can help us understand social and ecological ruptures in the here and now” (emphasis mine). Furthermore, Jensen observes that many intellectuals associated with institutions — “universities, think tanks, government, corporations” — go along with prevailing norms because they either believe in them or don’t want to get in trouble. Instead, he urges intellectuals to be “responsibly apocalyptic” and “to challenge the pre-ordained conclusions that the powerful prefer.” If intellectuals do not confront these norms, then the powerful need not worry about being accountable for their actions. I referenced Dr. Jensen’s work in a blog piece in 2013, “The social responsibilities of intellectuals at a time of extraordinary human need,” written in conjunction with my participation in the biennial Congress of the International Academy of Law and Mental Health.” In that post, I invoked “responsibly bold” as my catchphrase for how scholars and intellectual activists should conduct themselves. I agree with Jensen that we are living in an era marked by extreme inequalities of wealth and power distribution. These inequalities surely relate to a market-based economy run amok. In addition, they implicate power grabs in many societal settings that may transcend political labels — unless, of course, “thuggishness” counts as an ideology. I have witnessed these dynamics in the workplace issues I study, research, write, and advocate about on a regular basis. For example, workplace bullying is directly linked to organizational leadership and abuses of power. Though perpetrated by individuals, work abuse cannot flourish without buy-in and endorsement from the top. Also, the widespread practice of unpaid internships, especially in the private sector, exploits labor under the guise of gaining “experience” and “credentials.” It also excludes those who cannot afford to work without pay. Topics that haven’t been focal points for my scholarship, but that have appeared regularly on this blog, include exorbitant student loan debt, long-term unemployment for older and younger workers alike, and America’s burgeoning retirement funding crisis. In the U.S. alone, these are all symptomatic of a broken economic structure and social safety net. Those of us who engage the world of public ideas have a change-making opportunity to be responsibly bold. We should put forth sound analyses, interpretations, and recommendations for the greater good, especially during this plutocratic, New Gilded Age that has become our reality. If that’s what being “apocalyptic” is all about, then so be it. What separates the “best” workplace abusers from the rest? Over the years I’ve heard and read more stories than I’d like about severe workplace bullying and related behaviors. It’s not pretty stuff. But after a while, patterns emerge, included those associated with perpetrators of the mistreatment. One of my central observations is that many of the “best” workplace abusers — the ones who get their prey and continually evade being held responsible — are calculating, committed, and smart planners. With task-oriented surgical precision and detachment, they plot and scheme. Like the serial killer who manages to escape capture, they’re usually a step or three ahead of everyone else. Some enable themselves by occupying positions where they can devote “quality time” to planning. While others do real work or otherwise conduct their lives, the expert bullies use chunks of time to assess and strategize, often obsessively so. They also find ways to access, control, and manipulate information and resources to which others, especially their targets, are not privy. This means, of course, that they need organizational sponsors who enable them or at least let them have free reign. I won’t attempt to match this proclivity for careful planning against clinical criteria for conditions such as antisocial personality disorder (psychopathy, sociopathy) or narcissistic personality disorder. While I have no doubt that many of the worst workplace bullies fall into these categories, I’m focusing here on one behavioral trait. Indeed, I’m simply making connections grounded in years of immersion in this realm: Among those who bully and abuse others at work, the expert planners often rank in the vanguard.